Ham and Cheese Sliders are fantastic football fare! I know you’ve probably seen these lovely sliders all over the Internet as “Funeral Sliders.” That’s such a kooky, nondescript name that I couldn’t see using it. Ham and Cheese Sliders use King’s Hawaiian rolls that have been coated with a mixture of half Mayo and half Miracle Whip. They include ham, Swiss cheese, a lovely sweet and tangy poppyseed sauce with mustard, Worcestershire sauce, brown sugar and dehydrated onions. The combination absolutely rocks! Back in July we had one final lunch party at our house the day before we started packing up everything in our house and getting ready to move. One of the guys made up a batch of these delicious Ham and Cheese (funeral) Sliders. I’d begged him to make them again because he brought them to our Super Bowl party last February, and I probably had at least five of them on that night! For this party in July, I made Philly Cheesesteak Sliders and BBQ Meatball Sliders along with a couple of salads. The sliders were all fabulous and gobbled down quickly. I knew that after trying his sliders a second time I’d have to badger him again for the recipe and make them myself. Well, he did give me the recipe although I’ve combined the best from several versions of this recipe in this version. 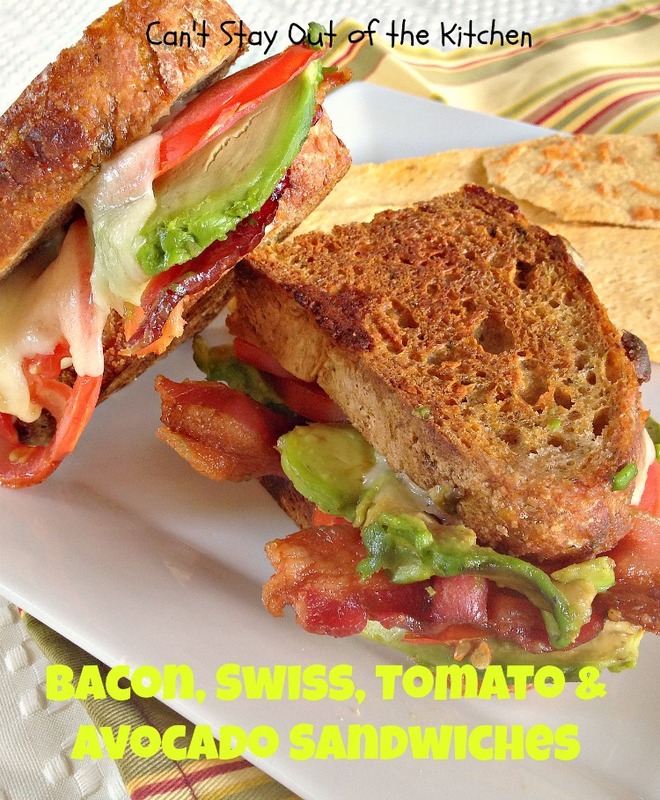 I found a couple of events that were conducive to serving these sandwiches and was so glad I made them up. The first event was for a houseful of girls at our church who were having a discipleship activity and an overnighter at a friend’s home. I told her I’d take care of all the food. The first night I made tacos and the second night I served these sliders. The girls raved over them. As it happened, I made three large pans of Ham and Cheese Sliders (24 each pan), enough for this activity and two other events. I wanted to leave a pan for John to take to his office that week, but as it turned out he was out of town so I ended up taking all of the rest of them to our Sunday night care group. They loved them and they didn’t last long there either. 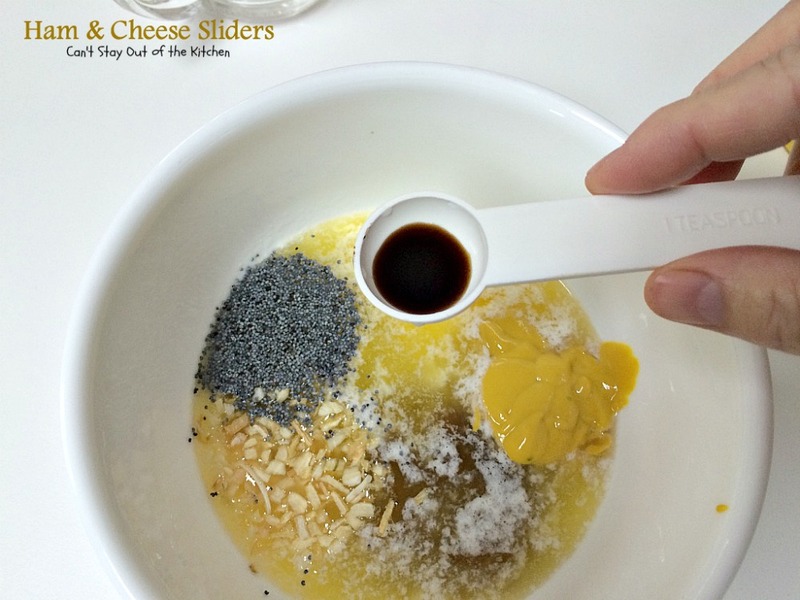 While you can make these sliders a day in advance and then heat them before you’re ready to serve them, let me make a couple of recommendations. Even if you refrigerate these, you will only need about 20-25 minutes to heat these sliders up to the point of the cheese melting. If you keep them in the oven any longer or try to keep them warm at a low temperature, the bottoms will burn. While it won’t affect the taste, it certainly will affect your presentation! I will tell you that these sliders get rave reviews every time they’re served. And rightly so. They’re as scrumptious as can be. I highly recommend them for any tailgating party or the Big One–your Super Bowl party! But be prepared. 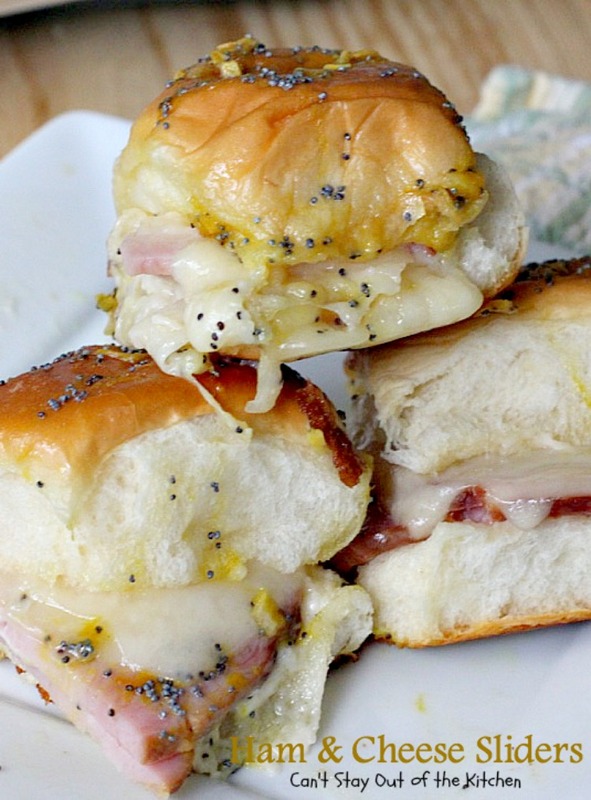 Ham and Cheese Sliders are not only addictive, don’t plan on bringing home any leftovers! 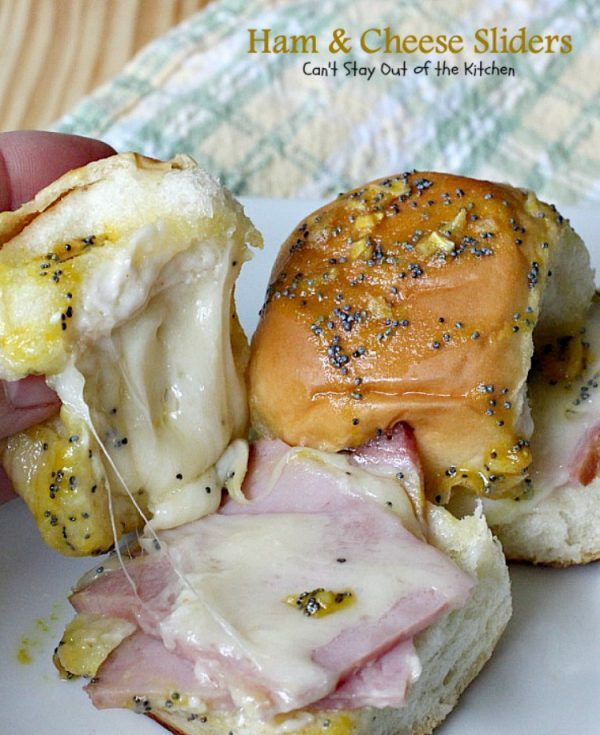 Ham and Cheese Sliders (a.k.a. 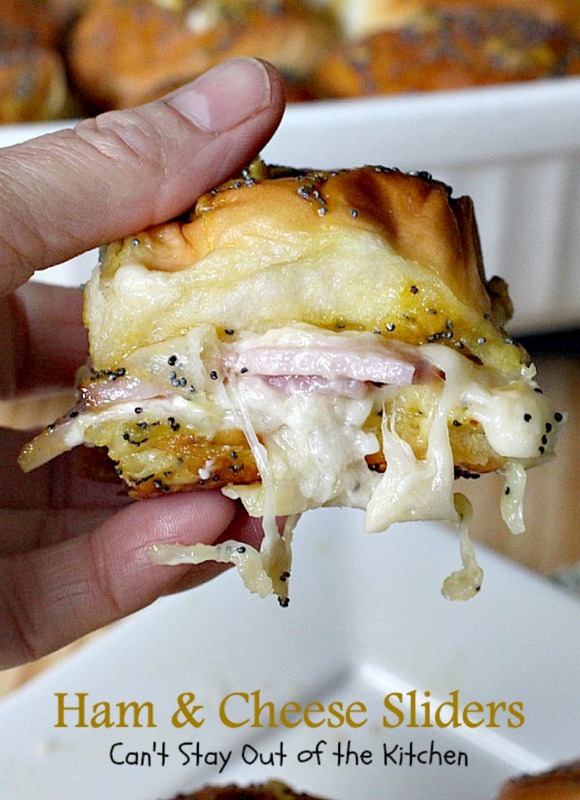 Funeral Sliders) are some of the best sandwiches you’ll ever eat. 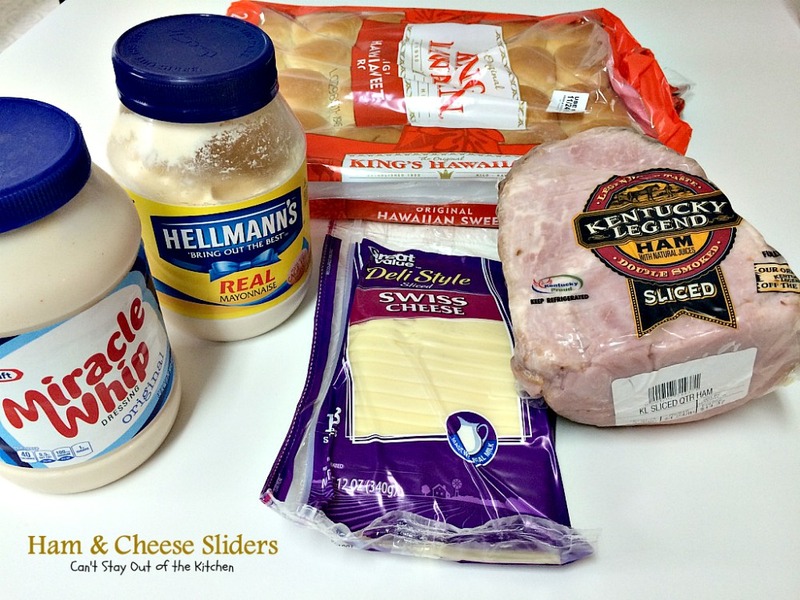 If you love ham and cheese sandwiches, you’ll love sliders made with King’s Hawaiian Rolls. Every bite is filled with gooey deliciousness! I used these ingredients for the sandwiches. Combine mayonnaise and Miracle Whip. Cut King’s Hawaiian rolls in half. Spread mayo/Miracle Whip spread on both sides. (You won’t use all of the mixture). 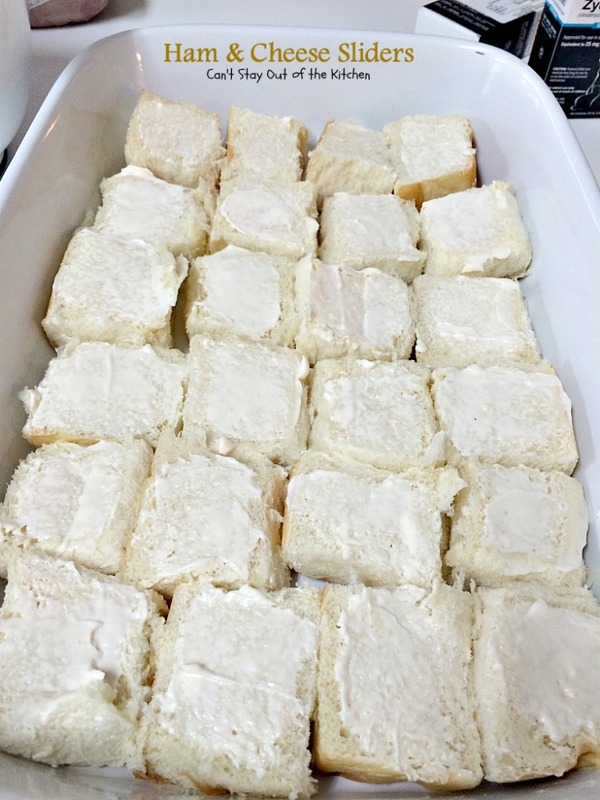 Place the bottom halves of the rolls into a glass baking dish. I placed 24 rolls in this 10×15″ dish. Fit them tightly into the dish. I cut each ham slice in half. To each half, I folded it in half again so that there were two-quarters of a slice of ham on each bun. I did the same with the Swiss cheese. One half or two quarters of each slice of cheese was placed on top of the ham. Cover with the top half of the King’s Hawaiian rolls (spread with mayo mixture). 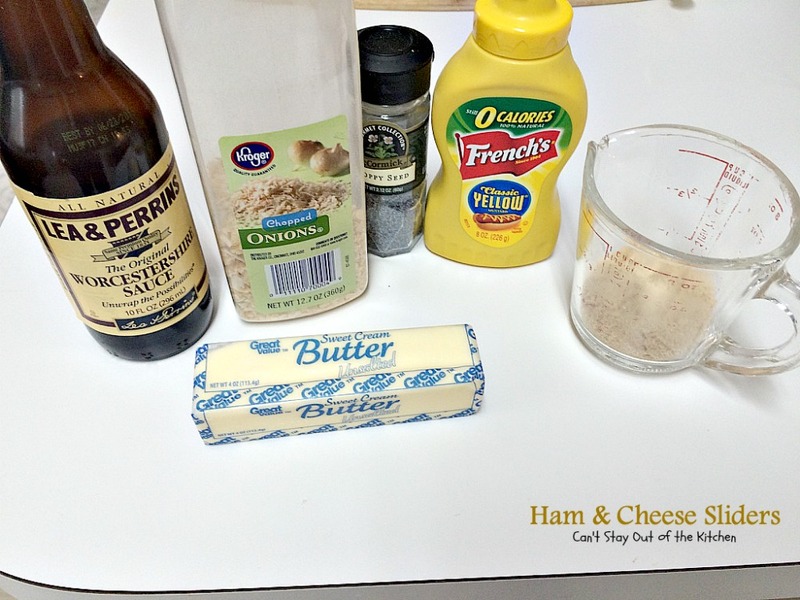 I used these ingredients to make the poppyseed topping. Melt butter. Add remaining ingredients. With a pastry brush, spread poppyseed mixture evenly over top of the rolls. Make sure the onions get spread onto each roll. 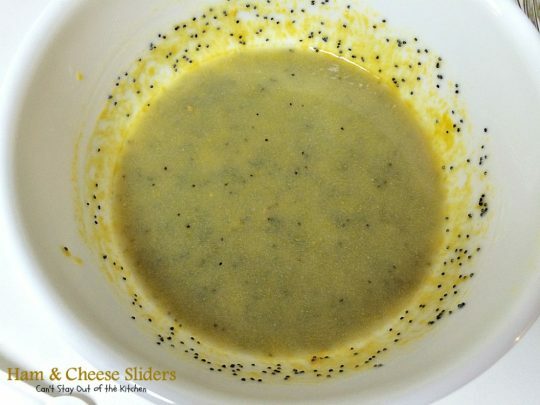 Use up the whole amount of poppyseed sauce. You can refrigerate the rolls at this point for up to 24 hours if desired. Cover rolls with foil. Bake in a 350 oven about 10-15 minutes. Remove foil and place rolls back in the oven another 5-10 to toast the bread and melt the cheese. Be careful not to over-heat the rolls or the bottoms may burn. Serve immediately. 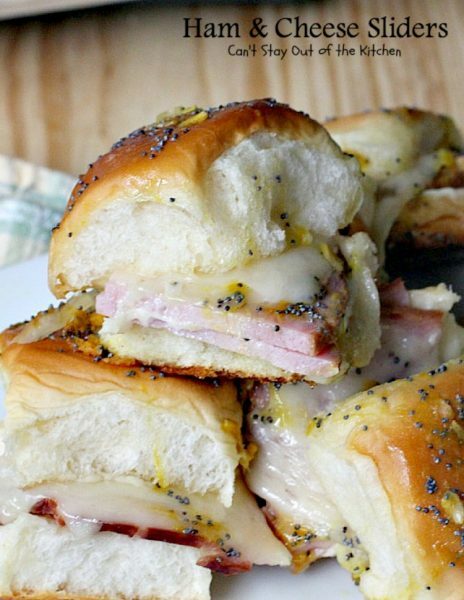 If you love ham and cheese, you’ll love how they come together so delectably with this tasty butter-poppyseed sauce. It’s a little bit sweet and a little bit tangy. 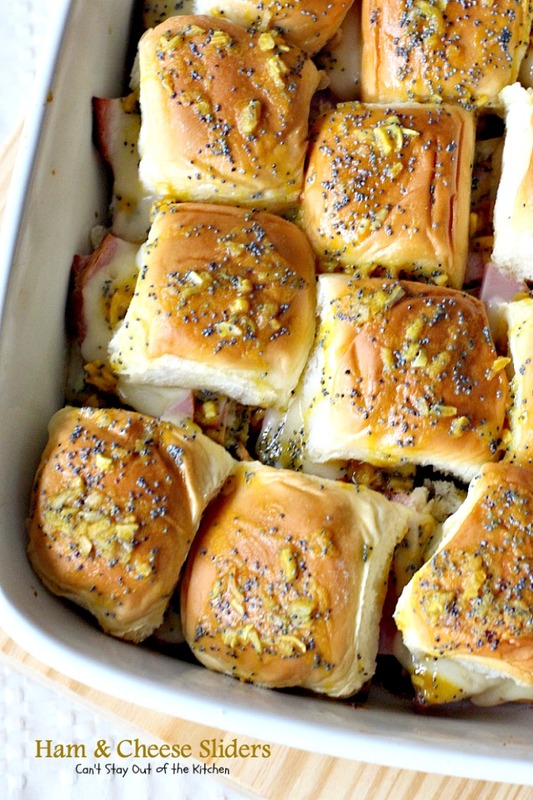 These scrumptious sliders are some of the best you'll ever eat. 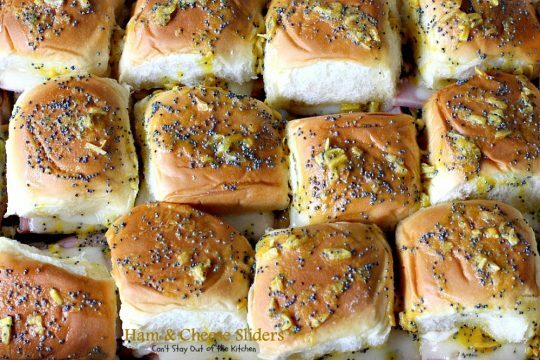 Also known as "Funeral Sliders," these are scrumptious treats for tailgating parties or the Super Bowl! 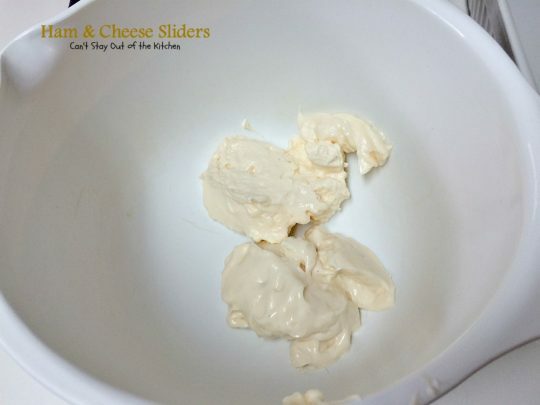 Mix Miracle Whip and mayonnaise together in a small mixing bowl. Spread the insides of the rolls with mayonnaise mixture. Place the bottom portion of each roll into a 10x15” glass baking dish. 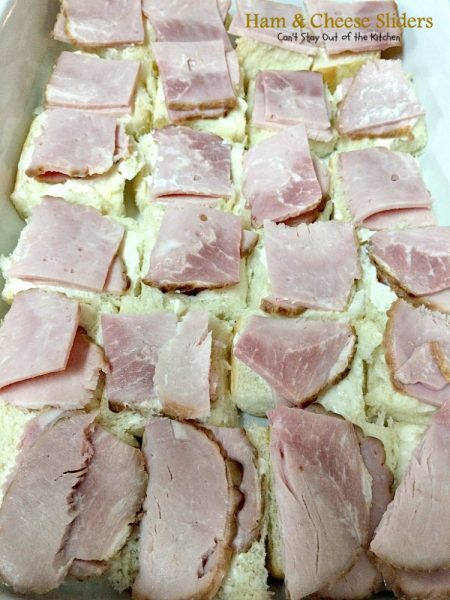 Place two ham slice quarters on each roll. 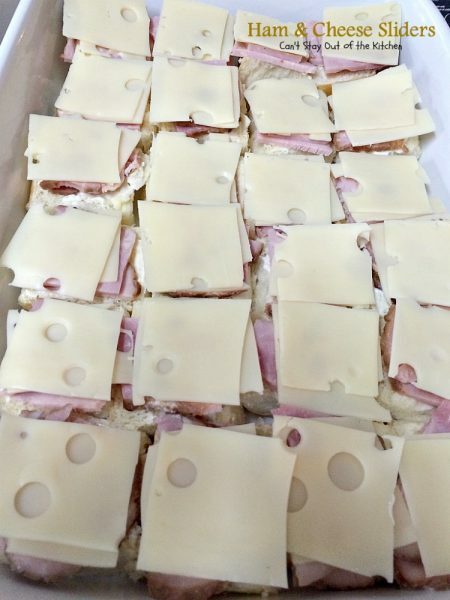 Top ham with two quarters of each cheese slice. Place top of rolls on top of the cheese (after you have spread mayo mixture on each one). Add brown sugar, poppy seeds, minced onions, mustard and Worcestershire sauce. Drizzle poppy seed mixture over top of each roll being sure that each one gets some of the minced onions. Allow sliders to sit on counter about 10 minutes so that butter begins to harden again. Bake at 350° for about 10-15 minutes. Remove foil and bake about 5-10 minutes longer, or until cheese melts. NOTE:You will not use all of the mayo/Miracle Whip mixture. NOTE: Be careful not to over cook these sandwiches or the bottoms will brown too much. If you have a hot oven decrease the time. You basically only want the cheese to melt which should not take too long in a preheated oven. 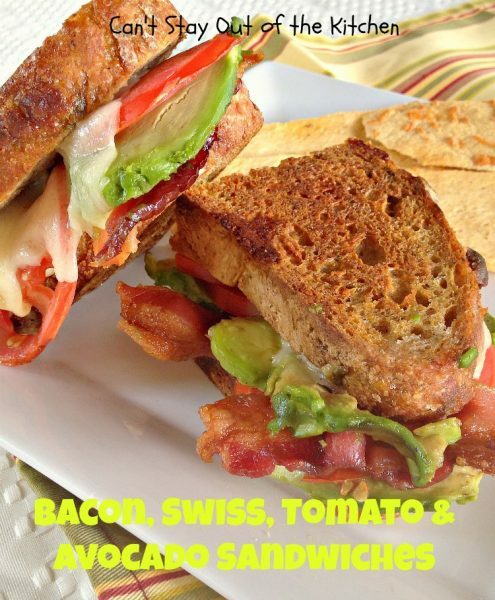 Recipe source: adapted from The Girl Who Ate Everything. These scrumptious sliders are some of the best you’ll ever eat. 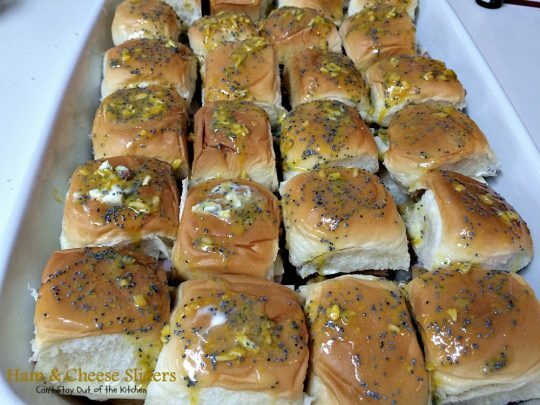 Also known as “Funeral Sliders,” these are scrumptious treats for tailgating parties or the Super Bowl! Place the bottom portion of each roll into a 10×15” glass baking dish. You will not use all of the mayo/Miracle Whip mixture. Ham and Cheese Sliders are great for tailgating parties. Place Ham and Cheese Sliders on your Super Bowl menu and they won’t last long!